Those of you who follow me regularly know that I have not yet had the opportunity to be represented on the Freshly Pressed page of WordPress.com. In my thorough studies of the blog posts that have earned that honor, I have noticed that many are often food related and deliver in-depth instructions and photographs related to food preparation and fine dining in the home. I thought it would be a good idea to write some posts on some of the fine foods that we eat a lot of here at The Brown Road Chronicles. So, today I’ve chosen four of our most popular meals, all of which have a French influence and all of which can be easily prepared at home with simple ingredients and in relatively short time for those of you who are busy with jobs and children and families. As with many fine foods from European cultures and especially those from France, they are often difficult to pronounce properly. Here at The Brown Road Chronicles, however, we encourage you to partake in these recipes with your finest French accent. We find this increases the pleasure you will experience when you finally get the opportunity to dine. Enjoy! An excellent choice for any meal of the day, but we typically prepare this fine meal for lunch and dinner. In a medium sized pot, boil approximately two cups of water. Add the Nudlés au Robért de Sponge and boil until tender. Drain the Nudlés au Robért de Sponge. Add approximately one cup of milk. Tear open the package of Fromage de Florescent Orange and sprinkle into pot. Mix thoroughly and enjoy. Note: the Nudlés au Robért de Sponge can be replaced with Nudlés de la Elbeaux. This is a quick meal that can be eaten at any time of the day as a snack or perhaps even as the main course of a bag lunch. Take the two slices of Wheat Bread and set them on a plate or counter top. Using a knife, cover one slice of bread generously with the Pinut Butré. Lick knife. With the same knife, cover the other slice of bread generously with the Gelée. Put the two slices of bread together with the Pinut Butré and the Gelée sides together. Enjoy. This meal makes another excellent choice for lunch or dinner. We don’t often eat this particular meal for breakfast as it has been known to cause slight indigestion. Insert Haute Dauge au Meat de la Mystére into Microwave and heat on high for 30 seconds. Do not be concerned if Haute Dauge au Meat de la Mystére has areas that look burnt and exploded. It will not affect the flavor. Insert Haute Dauge au Meat de la Mystére into Bunné. 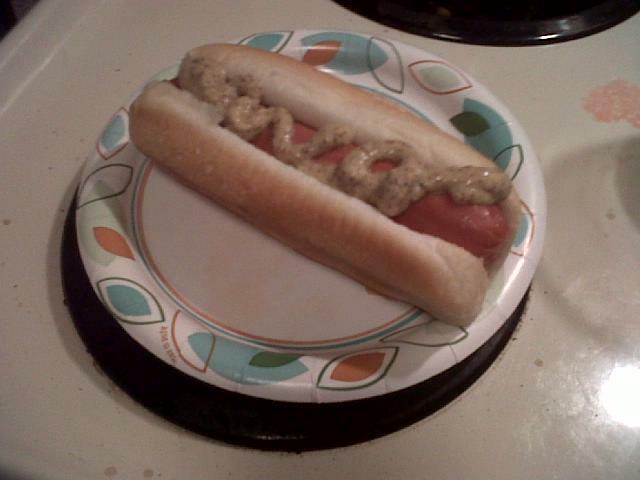 Add condiments as desired. Enjoy. 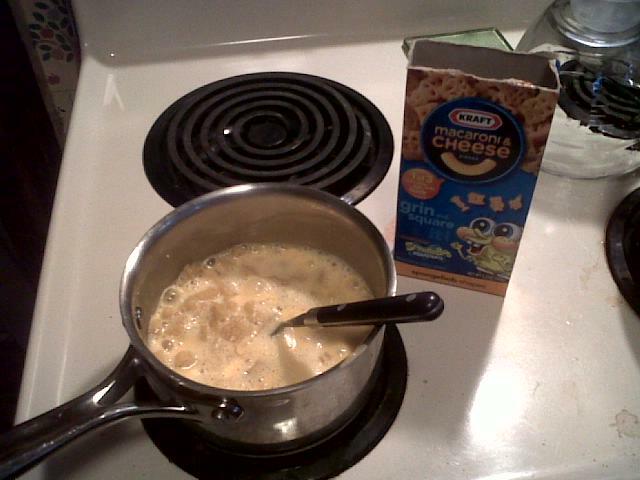 This is an excellent choice for breakfast, but also makes a great dinnertime meal when in a hurry. For example, I had Flakes au Maize avec Sucre as my dinner last night as I was rushing to a meeting I had to attend. Sometimes it can be less filling than desired, so when I returned from my meeting I had a Haute Dauge au Meat de la Mystére. Pour Flakes au Maize avec Sucre into a large bowl. Add milk. Enjoy. I hope you enjoy these fine French recipes and I encourage you to try them at home. We here at The Brown Road Chronicles certainly have gotten plenty of nutritious mileage from them. I will tell you as well, I thoroughly enjoyed writing about food and plan on sharing some of our other fine recipes in future posts. So please keep an eye out. I hate to cook, but I’m inspired by these exotic delicacies and do hope the proper WordPress authorities take note and emblazon them across the Freshly Pressed page immediately. If not, try posting something with a family photo from the 1960s – it seems to help. lol!! I’m not sure I actually possess a family photo from the 1960’s. I know there are some out there, from the late 60’s at least. Maybe I’ll try that next. I tried to duplicate the Flakes au Maize avec Sucre and set my kitchen on fire. I don’t know how you do it. When preparing that particular recipe, it is best not to have any fire or flammables involved. Wow, kudos from a real chef. Thanks! I’ll save the Nudles Chinois for my post on foods with Asian influence. You sure should have been Freshly Pressed a long time ago & more than once. Want to try something that sounds weird, but really is good. Somebody talked me into it a long time ago & now it’s the only was I eat them. Put a piece of cheese on that peanut butter & jelly sandwhich. I’ve had that, but I was REALLY stoned at the time….it was delicious. 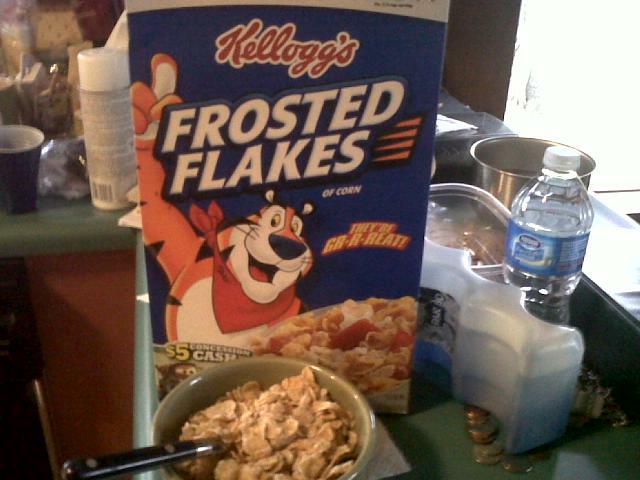 Most things do taste delicious when you are stoned. As always Jason, thanks for the kind remarks. Not sure I’m up for trying the Peanut Butter and Jelly and Cheese sandwich though! Bravo ~ so when does your cookbook come out??? 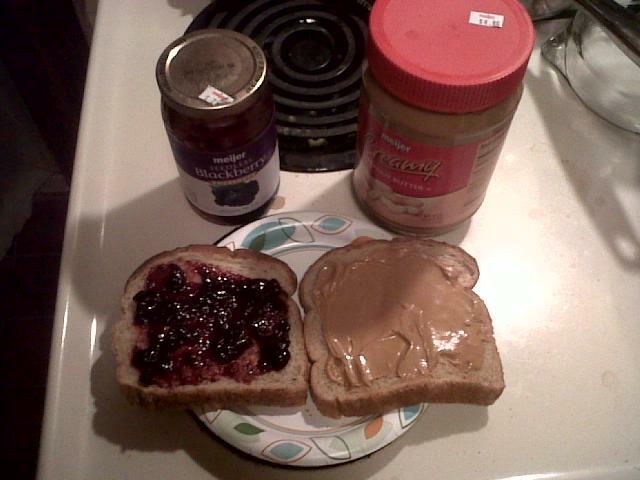 As for the mindslam/irratebass comments about the PB & J … I love my peanut butter with bacon. REALLY … it’s awesome! You should try it! Interesting what people will put on PB&J’s. I’ve now heard, cheese, bacon, pickles and potato chips. Anyone else like to add their PB&J toppings? marshmallow cream in place of the jelly…i ate it with the jelly when I was a kid. Im not a kid. I’ve never been a fan of the Marshmallow cream. I’m definitely in the minority though. I still eat them with Jelly, maybe because although I am no longer a kid I still want to be one. Hey, this would actually make a really good youtube video. Complete with french accent and all. Good read. You wanna blog roll? Ha ha, thanks. Unfortunately my acting skills are not as good as my writing… or uhhhh… cooking skills! The age-olde mysterie’ of what those french put into their nudles fromage is resolved. Why does is take them a 3 page recipe to get it right, though, when you did it in the time it takes to sneeze? The French have to make everything more complicated than it really is!. Interesting take on the PB&J! Anything that involves beer though, I’m typically okay with. Brilliant 🙂 Read this with a smile on my face, and also a small trickle of drool running down my chin that escaped during my salivation..except when reading the Pinut Butré one as I find the taste of this to be excruciatingly disgusting! Aaaahh, maybe that’s why they didn’t notice.. these were Blackberry shots. Pinut Butré and Gelée – At the Red House I have altered that recipe by omitting the Gelée and substituting Nutella and 1 petite tranche d’ananas. If the bread is toasted first, the Nutella and Pinut Butré get very gooey, a feature that children seem to love more than mothers. Thank you for posting these excellent recipes. I hope the Freshly Pressed Editors find you! I’ve never been on Freshly Pressed since I started over here in March 2008: I don’t think people want to know nothing on this site … because that’s what I write about. In Canada, French is a compulsory course from grade 8 to11. Being a West Coaster, I was always of the opinion that I wasn’t going to France; but I’ve been there a few times now … and my horrible French has come in handy. I need to send a thank you message to my French teachers. I’ve been blogging about food for the last 8 months and have had not a sniff of being freshly pressed. Just keep writing, that’s the best advice I can offer. My actual French accent is not very good. After writing this I’ve realized my actual French is not very good either! Damn, Steve…your French makes mine sound good! Thanks Wendy. Sadly even after 4 years of French classes in high school and college my speaking skills were still pretty much zero! I don’t even speak French, but I can tell these are delicacies! Thanks for the tips!